SAN FRANCISCO (KGO) -- Meteorologist Mike Nicco says tomorrow's storm is expected to bring moderate to heavy rain and possible flooding to parts of the Bay Area. This afternoon's storm is expected to hit parts of the Bay Area during rush hour so, drivers are encouraged to slow down and drive safe as there are concerns of hydroplaning. A graphic revealing storm concerns for the Bay Area on Monday, February 6, 2017 are seen in this undated image. 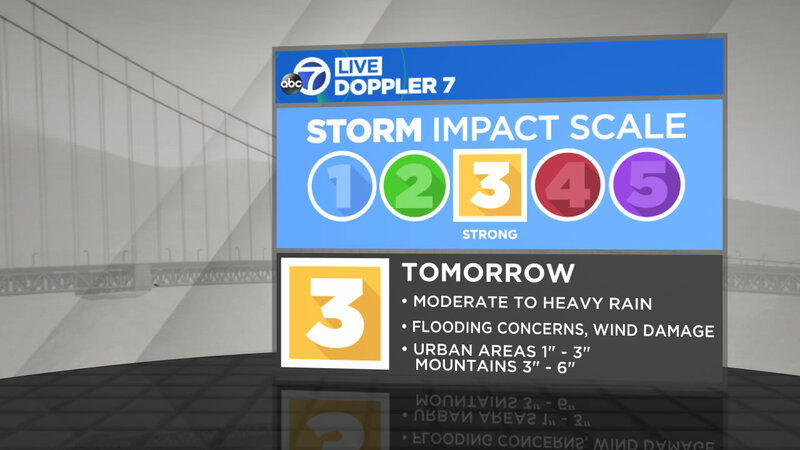 Tuesday's storm is a 3 on our Storm Impact Scale. The higher rainfall total and potential for flooding meet level 3 storm criteria. A graphic revealing rainfall potential in the Bay Area for Tuesday, February 7, 2017 is seen in this image. High tide will be occurring at 8 a.m. Tuesday, which will coincide with when the heaviest rain will be coming down in the central bay region. Current hydro-logic predictions reveal there will be minor flooding in nearby areas of Alameda Creek, Russian River and Guadalupe River. A graphic revealing a flash flood watch for parts of the Bay Area Monday, February 6, 2017 through Tuesday, February 7, 2017. is seen in this undated image. A graphic revealing a wind advisory for the Bay Area on Monday and Tuesday, February 6, 2017 and February 7, 2017 is seen in this undated image.